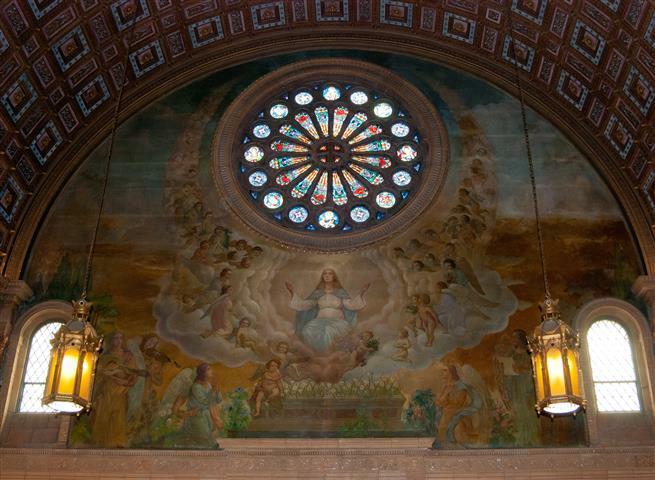 The “Assumption of Mary into Heaven,” painting by Joseph Mazur on left side in church’s transept. The Assumption of Our Lady Mary Into Heaven ~ Because this year the Feast of the Assumption falls on a Monday, it is not celebrated as a Holy Day of Obligation. However, we will be celebrating a Mass on Monday, August 15, at 11:00 a.m. in the Daily Mass (Sacristy Chapel). Please join us in honoring Mary on this day. The dogma of the Assumption of the Blessed Virgin Mary was proclaimed in 1950, but this observance has been celebrated on this day from the middle of the fifth century. On this solemnity, we profess our belief that Mary has gone before us, body and soul, into heaven. For her, the resurrection of the dead has taken place already. And thus the Assumption is technically an “Easter feast.” God invites us to eternal life, to enjoy the glorious new creation of his Son in body, soul, and spirit. Our final hope is the resurrection of our own bodies at the end of time to exist forever in this new order of creation. The Solemnity of the Assumption is our great celebration of this final hope. Mary is a pioneer for us in faith. She was the first among us to accept Jesus Christ into her life. In her bodily assumption, she is also the first fully to enjoy eternal life at the side of her risen son in the glory of heaven. Where she has gone, we hope to follow. We rejoice in the fulfillment of God’s promise in her, as we turn to her to guide us to the side of her risen son who reigns in heaven. Full-time Position Available ~ We are still hoping to bring on a new custodian before Jerry Gallisdorfer leaves in September so that he can show the new person around and train him/her in the basic tasks of the job. If you know of someone qualified for the job, please have him/her submit a resume to the rectory as soon as possible. Who Doesn’t Like a Picnic! ~ On Tuesday, August 2nd, we proved that we all do. But even something as “relaxed” as a picnic requires a lot of planning and hard work, and Blessed Trinity was up to the task. And so we send heartfelt thanks to everyone who played a part in making National Night Out and the CCCB’s “Summer in the City” such an enjoyable evening. We won’t name names, but you know who you are: the folks who arranged for donations; gathered the grill and tents and shopped for essentials; made sure there was ample ice to keep all the drinks cold; hauled tables and chairs; set up games and erected canopies; prepared side dishes and desserts; provided entertainment for the children; endured the fire and smoke to grill our hot dogs and hamburgers; made numerous trips up and down stairs with food and utensils – and then did it all in reverse at the end of the night as we put everything back in its place. Whew! In between, we hope you all enjoyed meeting and dining with neighbors and dancing to the music of J.J. Williams. Thanks again to a wonderful team of BT volunteers. Click HERE for a photo gallery from our National Night Out celebration. 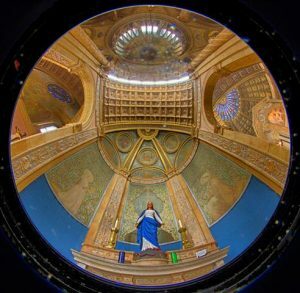 Weekly Highlight from Faithful Citizenship: A message from Sister Maureen Harris ~ How does the Church help the Catholic Faithful to speak about political and social Questions? Part 1 of A Well-Formed Conscience is so important in regard to forming moral consciences that I feel I am not doing justice to it and encourage you to read the document for yourself. (Available at www.usccb.org/issues-and-action/faithfulcitizenship/upload). The section on “Making Moral Choices” contains articles #31 – 39. #31 – This exercise of conscience begins with outright opposition to laws and other polices that violate human life or weaken its protection. #38 has a beautiful quote from Pope Benedict XVI, in his reflection on the Eucharist. It is “The sacrament of charity,” challenged all of us to adopt what he calls “a Eucharistic form of life.” This means the redeeming love we encounter in the Eucharist should shape our thoughts, our words, and our decisions, including those that pertain to the social order. Are You Parishioners in your 20s and 30s Looking to Make a Meaningful Difference in Our Community? Meet other young people, have fun, and put your faith into practice? Then we have the perfect event for you – “Give Back!” Give Back is a day of community service open to young adults ages 18-39. On September 10 volunteers will spend the morning serving at various non-profits around Buffalo to help positively impact our community. Afterwards, there will be a celebration at Canalside with a free food truck lunch, music and more. Volunteers must register in advance so sign up at www.HaveFaithBuffalo.com today! 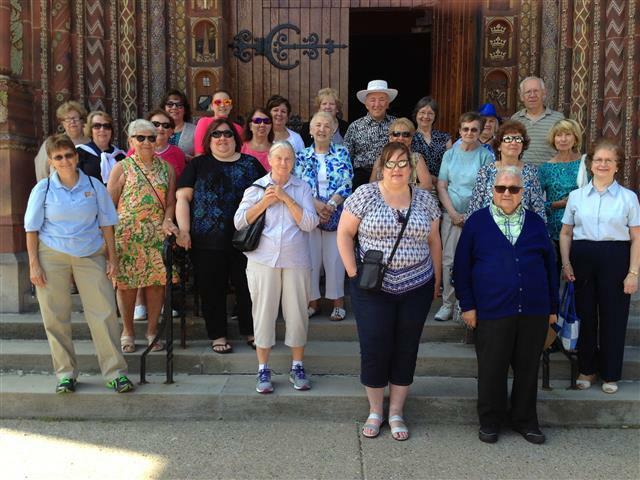 in Blasdell, NY for a guided tour of the church on July 19, 2016. Free Dinner Program on Relieving Chronic Shoulder Pain ~ Catholic Health is sponsoring a free dinner program, “Why Live with Chronic Shoulder Pain?” on Tuesday, August 16 from 5:30-7:30 pm in the Community Room at Kenmore Mercy Hospital, 2950 Elmwood Ave. Kenmore. Joint local shoulder and joint experts, Ryan Wilkins, MD and Joe Lorenzetti, DPT as they answer your questions on the causes of shoulder pain, home remedies, when it’s time to see a doctor, and surgical and non-surgical options. Space is limited. Reservations are required by calling Catholic Health’s HealthConnection at 44-6205 or by registering online at www.chsbuffalo.org/events. Infant of Prague Lawn Fete, 921 Cleveland Drive, Cheektowaga, will be having their lawn fete on August 26-27 – rides and games, carnival food, games of chance, a beer tent, entertainment, a basket extravaganza and much more. On Friday the rides, midway and beer garden open at 5 pm; basket raffle extravaganza from 5-10 pm; “Party of Nine” in the beer garden from 7-11:30 pm. On Saturday the rides and midway open at 12 noon; basket raffle extravaganza from 12-10 pm; “Kids Zone” featuring Party Animals Petting Zoo, face painting and games from 1-6 pm; Krolick’s BBQ dinner from 4-6 pm (or sold out): “Hit ‘N Run” in the beer garden from 7-11:30 pm. Artisan Fair & Farmers’ Market ~ Father Baker Manor, 6400 Powers Road, Orchard Park, will be sponsoring its Second Annual Artisan Fair & Farmer’s Market on Saturday, August 27, from 10 am – 4 pm. The event is open to the public and will be held rain or shine. The community is invited to enjoy local artisans, crafters, and market vendors. There will also be a Lucky Draw Raffle for a number of prizes. All proceeds to support special projects at Father Baker Manor, a Catholic Health Skilled Nursing Facility. For more information visit www.chsbuffalo.org/FBMfair or contact Jill Hirczak at jhirczak [at] chsbuffalo [dot] org or by calling 716-209-0744. Summer Celebration Features Big Band Dance Under the Stars! Sunday, August 28 from 7-9 PM, St. Joseph University Church will host an outdoor Big Band Concert and Dance featuring the Jim Tudini Band with Bobby Militello. Join us for a great summer evening of music and dance under the stars! The Jim Tudini Band is an 11 piece contemporary big band perfect for dancing. Tudini has played with such notables as the Tommy Dorsey Band, Doc Severinson and the Buffalo Philharmonic Orchestra. The band specializes in traditional big band music as well as songs from the 70s through the 90s. Donation for the dance is $10 per person at the door. Beverages and light snacks will be available for purchase. For information contact 833-0298.